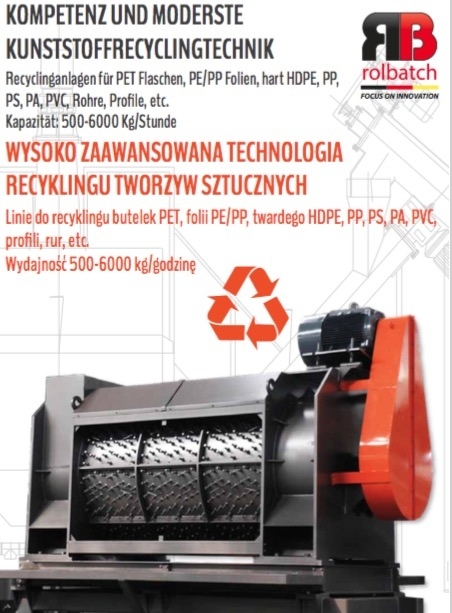 We invite you to familiarize yourself with our offer for plastic recycling machinery and equipment. Recycling has been around for years. Warranty and post-warranty service provided by Rolbatch. It is possible to start production at the customer, train the employees. Consulting at every stage of the project. Help with the sale of finished regranulates. - complete lines for washing film and hard PE, PP, PVC, PET, ABS, PS, PA, PMMA etc. It is possible to complete the whole line for recycling, or to purchase individual equipment. We help start-up companies in the industry and companies entering the market. We carry hand designs from A to Z. Take advantage of our many years of experience !! Machines are on a 12 month warranty. The service is provided by Polish and German service personnel. Leasing, assistance in obtaining grants, loans or loans for grants is possible. We can also provide complete lines for extrusion and recycling of plastics, with screen changers, single or double degassing, metal detectors, etc. Configuration of machines according to individual needs.